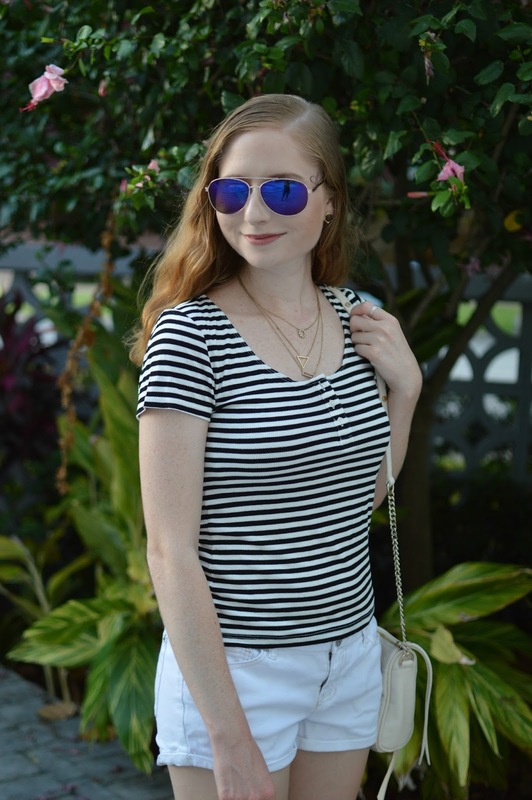 I'm back with another outfit post today! 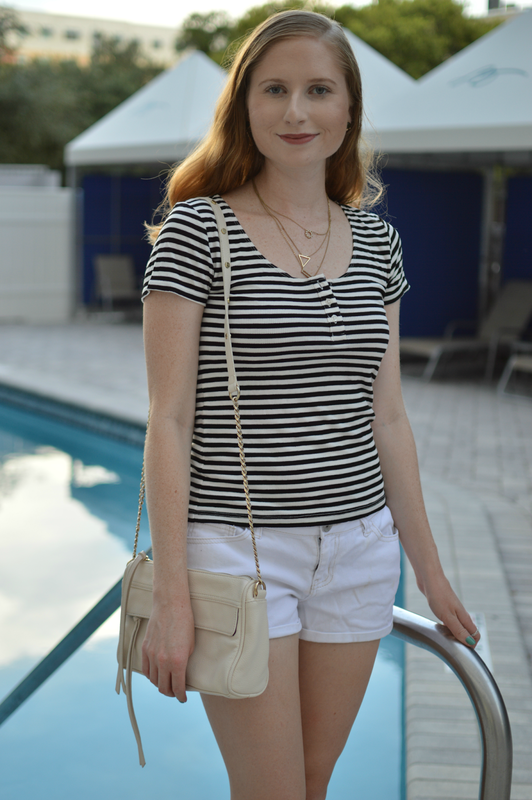 This is honestly all I wear during the summer months: a striped top, white denim shorts, and a crossbody bag. I found my Aeropostale top in the sale section for $3.99. It feels comfortable enough to last all day without feeling sticky in the heat. 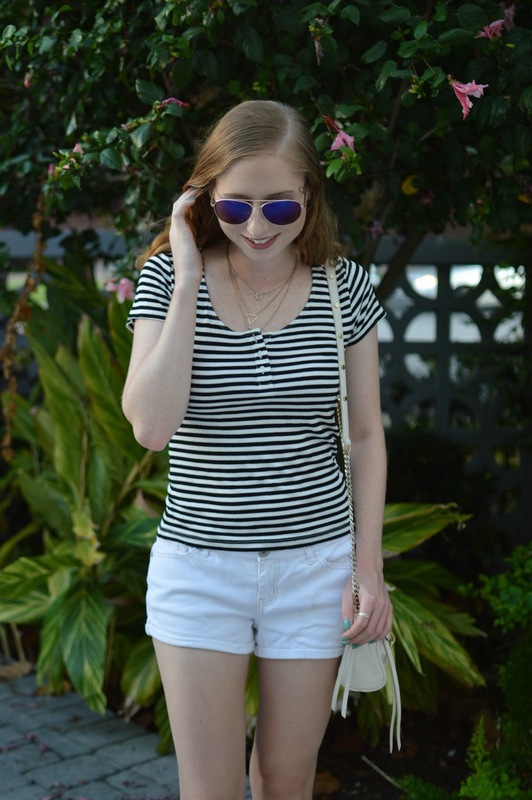 These white denim shorts are also stretchy and SO cheap! 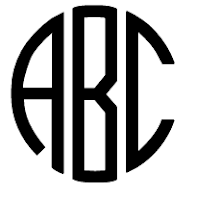 There are tons of similar options toward the end of this post to check out, too. I've also been trying out some new makeup items. The foundation I have on is Marc Jacobs Re(Marc)able Foundation, Full Coverage Ivory Light. It is quite expensive but I can not get enough of it! It covers every single thing you need to hide whether it be redness, blemishes, or dark under eyes. I also purchased a new palette from Pacifica, a brand that uses natural minerals and ingredients. This palette has hightlighters, a blush and bronzer, and six gorgeously pigmented eyeshadows. And lastly my lipstick is quickly becoming an everyday essential. NYX has some incredible makeup items and their lipsticks are no exception. It is a dupe for the Kylie Jenner Lipstick 'Candy K'. This one is way more attainable and still holds its matte finish for hours on end. It also is $7!